‘Neue Heimat’ was the largest and most prominent non-state housing corporation in post-war Europe. For more than 30 years, the union-led building corporation was responsible for the planning and construction of more than 400,000 apartments as well as, from the 1960s onwards, numerous municipal and commercial buildings in Germany – the majority of which are still standing. ‘Neue Heimat’ was a beacon of hope for those seeking to participate in Germany's so-called “economic miracle” or Wirtschaftswunder. The scandalous collapse of the company in the early 1980s sent a shockwave through West Germany and marked the end of an era. 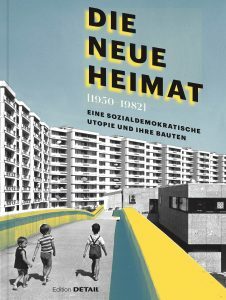 With the benefit of more than a generation's hindsight, we are now well placed for a critical survey of Neue Heimat: What has become of the – still much-touted – Social Democratic vision of "a right to housing for all"? On the basis of numerous historical photographs, plan materials and short articles large housing estates such as the Neue Vahr Bremen or the overflow city Neuperlach as well as gigantic large-scale projects of the Neue Heimat Städtebau like the ICC Berlin are documented. Including a large number of articles of authors like Andres Lepik, Hilde Strobl, Oliver Schwedes, Thomas Sieverts, Walter Siebel, Michael Mönninger, Sina Brückner-Amin, Silke Langenberg, Vera Simone Bader, Franz Labryga, Andreas Hild, Andreas Müsseler, Norbert Kling, Max Ott and a photo essay of Myrzik and Jarisch.